It's that time of year again! No, I'm not talking about the holidays. It's time for the new Mobile Azalea Trail Maids to be announced! 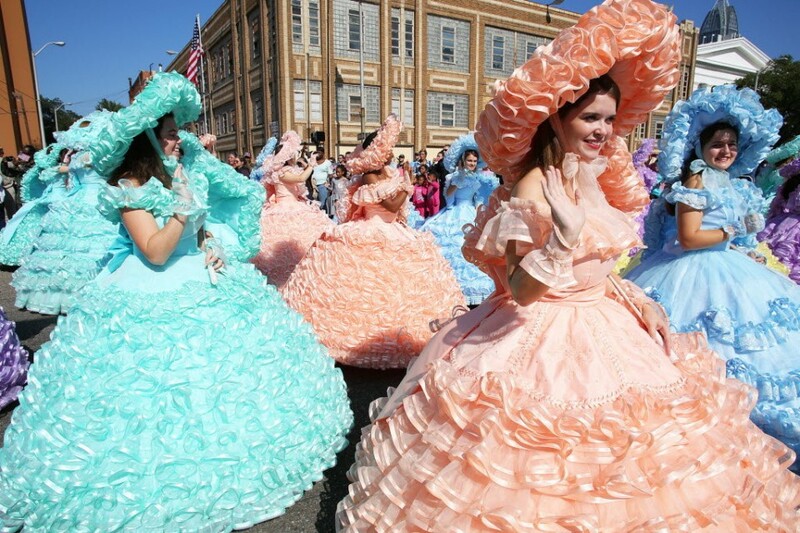 Each year in December, the Mobile Alabama Jaycees sponsors the Mobile Azalea Trail Maids. The Maids serve as hospitality ambassadors for Mobile at a variety of civic events on a national, state and local level. The purpose of this program is not just to have a beautiful, handmade antebellum gown (although that’s a big plus in my opinion), but to promote tourism and local hospitality to Mobile, Alabama. The Azalea Trail dates back to the 1920's and eventually led to Mobile being named the Azalea Capital of the United States. It wasn't until 1949 that the Trail Maids were added to the mix. The first court consisted of eight girls from local high schools. Fast-forward to present day. Becoming an Azalea Trail Maid is a process and anything but easy. The group has grown to 50 rising high school seniors who are chosen yearly and serve as official ambassadors to the city of Mobile, Alabama. The application and interview process is rigorous and preparations begin years in advance. The application process starts with local high schools. Many schools offer classes and conduct random interviews to get the girls ready for the next step in the interview process. It isn’t enough to be smart or pretty. The girls must be well-rounded, cultured and knowledgeable about the state of Alabama and more in particular, Mobile. At the very heart of this program is a desire to serve and bring pride to the great state of Alabama. Southern girls are taught at a very early age that it's both a duty and pleasure to serve our committees and make our world a little better each day. The Azalea Trail Maid program instills this tradition and obligation in a whole new generation of girls. The large, initial application pool of 250 is cut to 100 girls by representatives from area high schools. It is then that out-of-town judges decide the 50 who will represent the Azalea Trail. The 50 girls are notified via US Mail (I love that!). The interview process is famously difficult and challenging and can include questions relating to current events, the girl's resume, career goals, national/world issues, social change or Mobile history. Becoming a Trail Maid is a family affair. Many of the mothers of Trail Maids have a “Trail Room” in their homes. Each girl receives a wooden holder to display the dress along with a hat, parasol, gauntlets, cummerbund, a bow with a sash, pantaloons, a long-line bra, shoes dyed to match the dress and a faux fur-lined cape (for cold weather). As you can imagine, many mothers also served as Trail Maids and want their daughters to carry on the tradition. Over the years, the group has appeared in the Macy’s Thanksgiving Day Parade, Disney World’s Easter Parade, the Inauguration of President Obama, the Indianapolis 500 and the Pasadena Rose Bowl Parade just to name a few. As with anything of quality, all of this does come at a cost. The dress alone starts at $3,000 (for a base model) and girls try to get on a seamstress’ dress list four years before even applying or being accepted to be a Trail Maid. Each dress is unique and takes roughly 200 hours to create and weighs 40-50 pounds. Although the colors of each dress are assigned randomly and are separated into five groups of 10 (blue, green, yellow, peach and lavender), the queen is assigned the lone pink dress of the group. This years’ queen is Miss Emilee Sprinkle. One of the many benefits of being chosen to wear the pink dress is a full-ride scholarship to Auburn University. Enjoy the pictures below which are provided by www.al.com (Alabama.com). The mission of www.al.com is to provide innovative ways to inform, connect and empower the people of Alabama and the communities in which they serve.